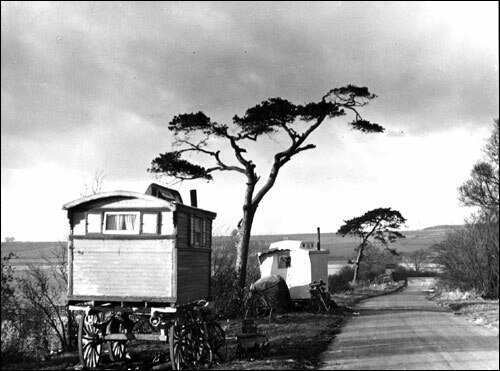 Based on the book "Ditchford Days"
(above) The Station in about 1920 and (right) a Vic Childs photograph of gipsy caravans parked at the Rushden end of Ditchford Lane which leads down to the station. Also at the bottom of the lane stands Ditchford Mill, close to the spot where bathing in the river was popular. Ditchford is in the “middle of nowhere”. It is at the boundary of three parishes; Irthlingborough, Irchester and Rushden. An ancient bridge over the river Nene and the mill was all that stood there until the railway arrived. An Act of Parliament decreed that wherever the railway crossed a turnpike road there should be a station erected, and so Ditchford Station was built in 1845. The road to Ditchford from Rushden was just a lane, but it was a main route for travellers going north, to Finedon and Kettering. Trains would have drawn the young boys from the villages to see these monsters steaming along the track, and with the river alongside, it became a local attraction for picnics and for swimming. In 1895 Rushden Council approached currier and farmer, Thomas Sanders of Rushden Hill (Higham Road) to ask if he would allow them to establish a “Public Bathing” area at Ditchford. The stationmaster in the 1940s used to sell ice cream and drinks to the visitors and would do good trade on Bank Holidays. This use continued into the 1960s. Ditchford Lane was also regularly used by gypsy families who would camp there for a few weeks at a time and then move on. There was a succession of caravans almost year round pitched at the top the lane close to where the A45 slip road, on the north side, runs today. Behind the railway station there was a large area, in Irthlingborough parish, where iron ore was mined. It is said that molten iron looks much like treacle and this was the basis of the tales told to children about the ‘treacle mines’ at Ditchford. The trains would cart away much of the ore and in 1912 a siding was built to facilitate this. The railway was part of the Northampton to Peterborough line and continued from Ditchford to Irthlingborough Station. This station was half way between Higham Ferrers and Irthlingborough, close to the river but strangely stood just inside the parish bounds of Chelveston, together with the Fitzwilliam Arms next door (both now demolished). Arthur George lived at Irthlingborough Station where his father was stationmaster, and as a boy would go to visit the master at Ditchford on occasions. Arthur was very well known in the area as he became a photographer and would also film events around the locality. He eventually moved to Rushden and lived in Washbrook Road where he had his studio. In 2001 a joint project by Irchester Parish Historical Society, Irthlingborough Historial Society and Rushden & District History Society saw everyone in the locality giving in photographs to be copied and memories to add to the historical research into Ditchford, its Mill and the Station. The book was edited by Jon-Paul Carr and the three Societies funded the publication, each receiving a third of the proceeds. Ditchford Station was the closest to Rushden. A local coach and horses could take travellers to and from the station until Rushden finally got a station in 1893 but this was only a branch line to Wellingborough. John Lymage (sometimes Limage or Limmage) lived at Saxby’s Cottages in Irthlingborough with his wife Sarah Elizabeth, son John William and daughter Annie Ellen (Lizzie) when the stationmaster’s post came vacant. John was born at Buckden, HUN, his wife was from Stanwick and their son was born at Lilbourne before they came to Irthlingborough in 1898. Their daughter was born soon after they arrived. In 1918 Sarah Lymage was brought before the court at Wellingborough for obtaining food without a ration book (she had not received book) and the Co-op at Irchester was summonsed for supplying her with the food. John was also charged, but their defence said they “lived three miles from anywhere” and it was confirmed that a mistake had been made. The judge ordered that the case against Mrs Lymage be withdrawn, her husband was charged 4s costs and the Co-op was fined 7guineas with 3 guineas costs. In ever loving memory of John, the dearly beloved husband of Sarah Elizabeth Lymage who died June 17th 1928 aged 65 years. Also their beloved son John William, 12th Royal Lancers who died June 3rd 1927 after 10 years suffering, aged 35 years. Also their beloved daughter Annie Ellen Dickens who died April 14th 1978 aged 80 years. Also her beloved husband Sidney Dickens who died November 16th 1982 aged 83 years. 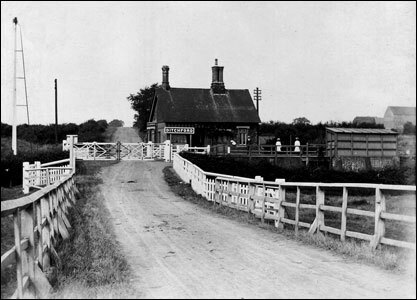 Ditchford station finally closed to passenger traffic in 1924 and goods in May 1950. For those 26 years it had been just a crossing and the station master was responsible for opening the gates to let motor traffic through, and closing them again for the trains to pass through. In January 2001 Irchester Historial Society, Irthlingborough Historical Society and Rushden & District History Society got together to gather all they could about Ditchford. A book was published in 2003, 'Ditchford Days - A Historical Investigation'.